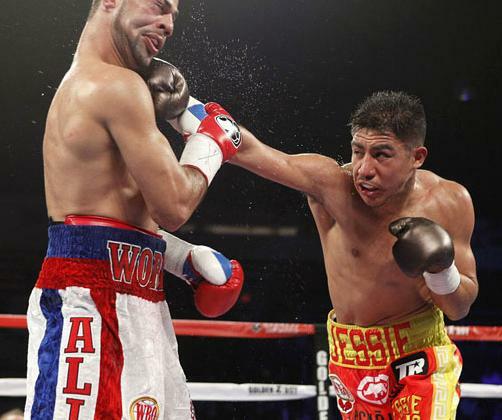 WASHINGTON -- When welterweights Sadam Ali and Jessie Vargas were matched for a vacant welterweight world title most viewed it as a toss-up fight with neither man holding any significant advantage. But when it was over it wasn't close. Vargas won decisively, knocking Ali down twice and knocking him out in the ninth round to win a vacant welterweight world title Saturday night in the co-feature of the Luis Ortiz-Tony Thompson heavyweight fight at the DC Armory. The argument against Jessie Vargas has always been that he doesn’t throw enough punches. That wasn’t an issue on Saturday as Vargas showed off his full array of punches against Sadam Ali, digging lefts to the bodies, mixing in jabs and right hands, dropping him twice and finishing him in the ninth round to claim the vacant WBO welterweight title at the DC Armory. Vargas boasted he was going to dominate Ali before the fight, that he wasn’t in the same class of him. While Ali performed well in his first title shot, Vargas was the more complete, stronger fighter, stopping him at 2:09 of the ninth round. WASHINGTON — Jessie Vargas talked all week about his new-found power. He said that he would show it off against undefeated former Olympian Sadam Ali on Saturday night at the D.C. Armory. Did he ever. After looking to be a half-step slow in the first few rounds, Vargas flashed his power in the middle rounds of the HBO co-feature, knocking Ali down twice before referee Kenny Chevalier stopped it at 2:09 of the ninth round.